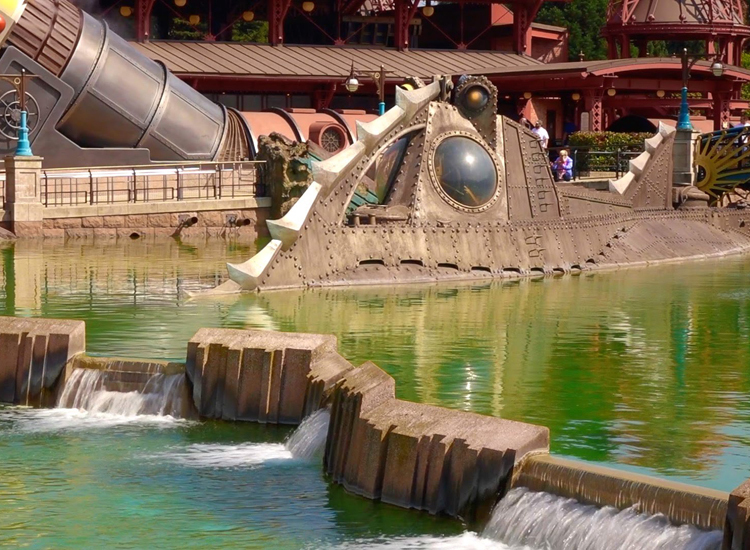 Nautilus is the name of the vessel that was used to explore the world created by the imagination of Jules Verne. In the Disneyland ride, the public walk through a wooden underground tunnel leading to the ship. The aged wooden panels, made of fibre glass, line the tunnel, they were also given a touch of linseed and walnut oils to give them the illusion that water was oozing through the cracks in the timber. The captain's bridge and engine room were given the appearance of rusted metal. The vessel we see from the outside was created in sculpted concrete. Our task was to make this look like aged oxidized steel. We used acrylic paints, highlighting some elements with metallic pigments of bronze, silver and gold.